I find myself on this December 23rd, making the Atomic Power Review entry hosting the 136th Carnival, thinking about all of the great achievements the pro-nuclear communication world in general has made this last year -- and this includes not just the "loose cannon" nuclear bloggers and podcasters and Twitter stalwarts and Facebook posters, but utilities and PR departments practically industry wide. While there's very much left to do, and a massive amount of work ahead, we who believe in nuclear energy have made tangible progress in our committed effort to spread fact instead of fear, and knowledge instead of supposition. This feeling of some small measure of satisfaction at our progress has convinced me that benevolence should be applied to this Carnival's hallmark APR feature. First... What is this? Normally, I'd ask for something really specific - and if you can tell me exactly what this is, that's fine. However, acceptable answers this time will also include either who built it, or for whom it was built. Or where it was built. Let's hope someone gets this one! The first Carnival entry this week is a sort of discretionary "Captain's choice" - the blog was not submitted for the Carnival, but I'm entering it at my choice. Why? Because the blog is absolutely brand new and covers a fascinating topic - Cyber Security. Let's get behind Manolya and her brand new blog. Manolya Rowe discusses the "Why, What, When and How" of designing nuclear security architecture. Yes Vermont Yankee posts a recent statement to the Vermont Public Service Board. Stuart Endsley describes the environmental effects of different types of power plants, from personal experience. Nuclear plants are the best for the environment. Meredith Angwin has written an op-ed for Valley News, concerning the moderating effect nuclear plants are having on energy prices in the Northeast. In the past couple of days, Rod Adams has been involved in a number of different conversations in which people who believe strongly that nuclear fission technology is beneficial also strongly counsel against the idea that nuclear energy advocates should emphasize that it is a wonderful tool to use in an effort to reduce carbon dioxide emissions. They choose a number of facts and pick at well known issues associated with climate models. They also point to the political and financial interests that stand to gain from carbon trading schemes or massive efforts to shift to “renewable” energy like wind and solar. When it comes to picking energy paths, there is as much need to understand human communications and decision process as there is to understand the technology opportunities. Business plays a role, political leaning plays a role, and international policy plays a role. Ben Heard is one of the growing number of environmental professionals who have seriously evaluated all options for reducing mankind’s annual production rate of carbon dioxide and discovered that the best tool available is nuclear fission energy. As a part of his continuing journey of discovery, he worked with Brown and Pang to produce a report titled Zero Carbon Options: Seeking an Economic Mix for an Environmental Outcome”. Dan Yurman with a list of free online news services essential for keeping current with developments in the nuclear industry and the news in nuclear -- and an excellent must-read nuclear book list. Do you have a favorite news source or best book on nuclear energy? Add suggestions in the comment thread. end-of-world scenarios we are hearing today. importance to the grid of sources such as nuclear power. 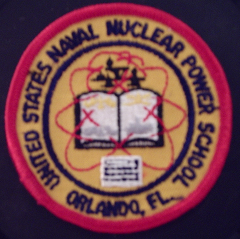 importance of this, and other early events, at Nuke Power Talk. India Kudankulam 1 will be delayed into January and Russia indicates costs for Kudankulam 3 and 4 could double if India's new nuclear liability law is applied. Japan is looking to allow new nuclear construction and reconsiders nuclear phaseout. Electrabel / GDF Suez submit restart plan for Doel 3, Tihange 2. That does it for this week's Carnival. All that's left is to tell you what you saw in the "What is this?" photo. 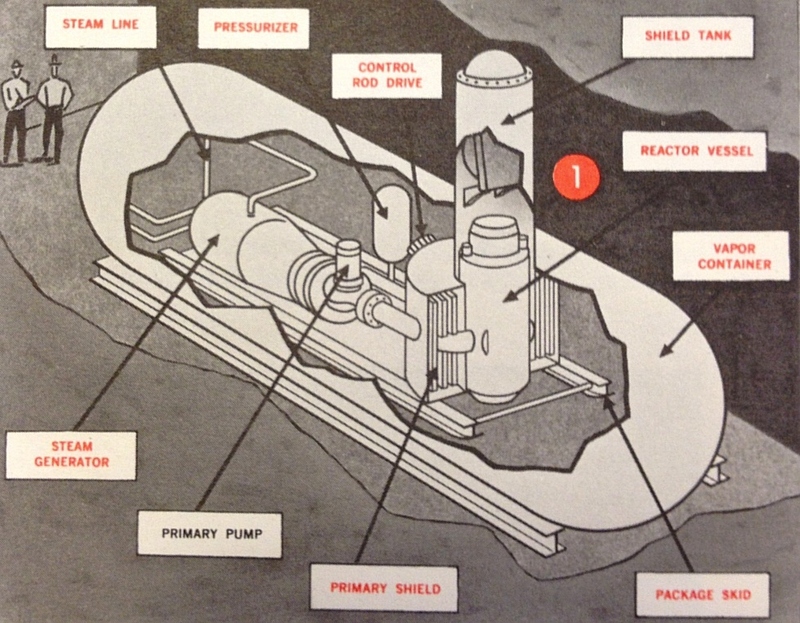 The illustration comes from a six-page ALCO Products insert found in a 1959 Nucleonics magazine, and depicts the configuration of the APPR-1a nuclear power plant, built at Fort Greeley, Alaska. This plant, later and perhaps better known as the PM-1a, was what we would today call an SMR or Small Modular Reactor plant. 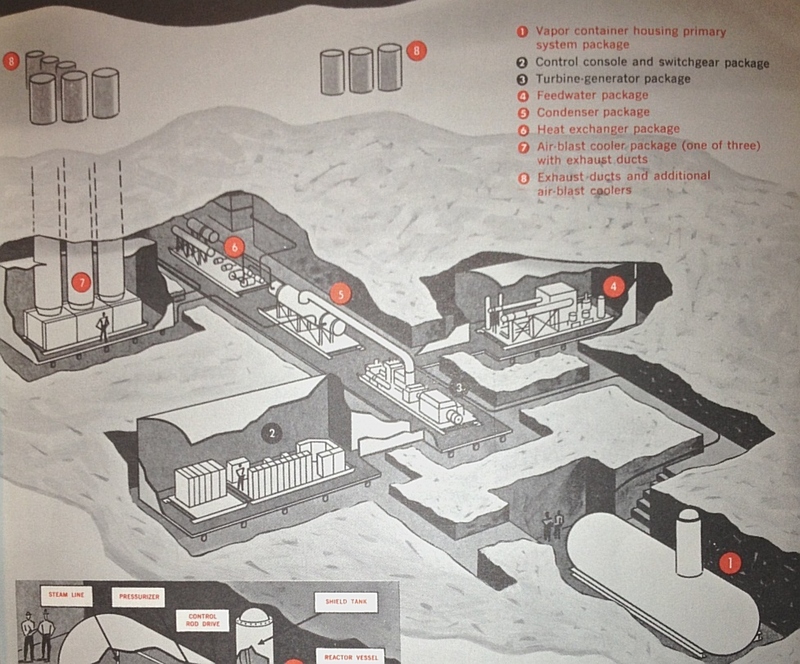 Below, from the same page of the insert, is an overall view (with legend) of the installation. As with all photos on APR, click to enlarge. 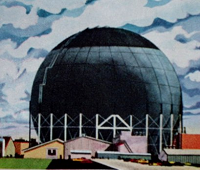 At the time this advertisement appeared, ALCO was still working with Peter Kiewit Sons, who was the prime contractor and A/E for the plant, to complete construction which was expected to be finished the following year. The plant included a pressurized water reactor rated 20 MWt, and the plant had a dual output of 1.68 MWe and 10 MWt space heat for the installation. It's of interest that these early plants weren't just truck transportable -- some were AIR transportable. From the caption to our original photo: "First truly packaged plant was purchased from ALCO by the U.S. Army. Reactor and component design and manufacture represent significant achievements in reaching Army's goal of air transportability to faraway sites." 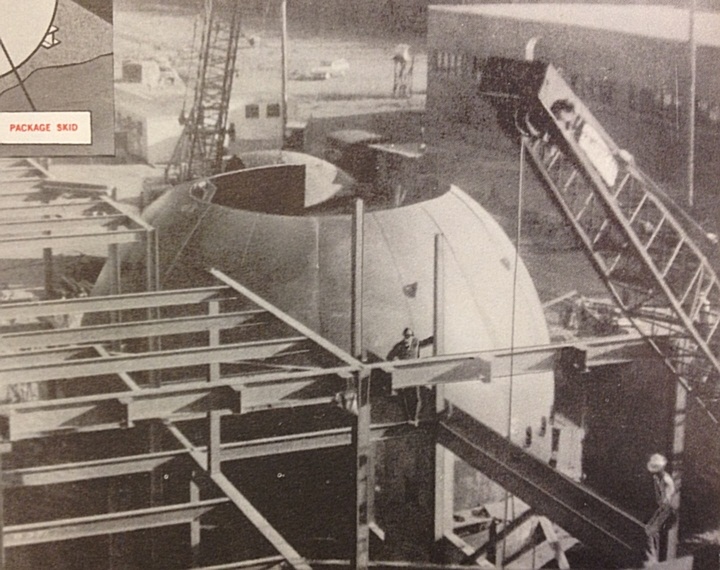 Above: "Under construction in Alaska is descendant of APPR-1. ALCO is building primary system under subcontract. ALCO components in the plant have been greatly improved as a result of prior plant experience." So if you guessed any of the following, you win: APPR-1a, a nuclear plant for the U.S. Army, an ALCO nuclear plant, or the nuclear plant at Fort Greeley, Alaska. You can see details of another remote nuclear powered installation, Camp Century in Greenland, which was also powered by an ALCO built reactor at the APR YouTube Channel - click here to watch this video, which runs half an hour and covers more of the siting and construction aspects of the site than powerplant aspects but is worth watching nevertheless to see just what environments the Army and the AEC were facing with deployment of early plants we'd now call SMR's. I hope you've enjoyed the 136th Carnival - and look for another installation next week! Some time back, there was a great deal of attention paid to the finding of flaws in the reactor vessel at Belgium's Doel Unit 3. 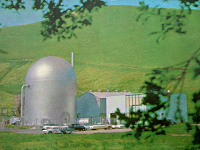 Click here to see my ANS Nuclear Cafe article on the subject from August 2012. Now, Electrabel (the plant's owner-operator) has released a report and a plan for restart has been sent to the Belgian regulator, FANC, who itself plans to release its final report in the middle of January, 2013. Electrabel's findings are not unexpected; official press release from December 6 is below. Over the last few months Electrabel has carried out an in-depth investigation in response to the indications found in the reactor vessels of Doel 3 and Tihange 2. On Wednesday, Electrabel submitted its conclusions and action plan for restarting both units, to the Federal Agency for Nuclear Control (FANC). Electrabel already submitted the technical dossier on Friday 30 November. Tests on more than 400 samples, performed by different laboratories, show that the metal of the reactor vessels is sound, with properties that meet the required standards. The technical report and the engineering and calculations demonstrate that the vessels’ structural integrity meets, within significant margins, all safety criteria for each of the detected indications. The investigations and calculations carried out were subjected to a stringent control procedure that was validated by outside experts. In conclusion, the results confirm the structural integrity of the reactors in question, justifying the immediate restart and safe operation of Doel 3 and Tihange 2. Electrabel also submitted an action plan that sets out certain additional safety measures it is taking to prepare for restarting the reactors, plus some additional short and medium term measures. It is now up to the FANC to provide its advice to the Belgian government. Electrabel is available to the FANC and its experts to answer any questions they may have on contents of the report. -FANC acknowledges receipt of the dossiers from Electrabel / GDF Suez, and a press release by FANC promises completion of review and release of findings in mid January 2013. At that time, according to FANC, the decision to dismantle or to restart the two reactors will be made. -To see an interesting October 2012 FANC backgrounder on this issue in English, click here. Below is a press release from Southern California Edison, concerning the recent finding by the NRC that steam generator tube testing being conducted by Mitsubishi did not closely match the design of tubes actually used in the steam generators at San Onofre. While that assertion by NRC is left to Mitsubishi to refute, it's important to understand that this testing has no bearing on the 70% power planned test period for San Onofre Unit 2. The press release below explains this situation. ROSEMEAD, Calif. (Dec. 18, 2012) — The Mitsubishi Heavy Industry testing under review by the Nuclear Regulatory Commission (NRC) was not consulted or relied upon in developing Southern California Edison's (SCE) proposed restart plan for Unit 2 – a plan which includes preventive tube-plugging and operating the unit at 70 percent power for a five-month period. SCE’s international team of experts conducted more than 170,000 inspections to understand the tube wear problem, and confirmed the effectiveness of the corrective actions we have identified to solve the tube wear problem. This work included three independent operational assessments of tube wear issues conducted by Areva Inc, North America, Westinghouse Electric Company LLC and Intertek/Aptech, none of whom based their review and recommendations on Mitsubishi’s testing. This was confirmed Tuesday by an NRC administrator at an NRC public meeting in Rockville, Md. SCE submitted technical information to the NRC on Oct. 3 in support of a proposed restart of Unit 2, which is safely offline. The unit will not be restarted until all plans have been approved by the NRC. The Unit 3 restart was not included in that regulatory filing and remains shut down. Unit 2 was taken out of service Jan. 9 for a planned outage. Unit 3 was safely taken offline Jan. 31 after station operators detected a leak in a steam generator tube. www.edison.com/songsupdate and at www.SONGScommunity.com. San Onofreis jointly owned by SCE (78.21 percent), San Diego Gas & Electric (20 percent) and the city of Riverside (1.79 percent). Infocast Presents Nuclear Export Controls 2013, Regulators and Experienced Compliance Managers to Gather in D.C.
Woodland Hills, CA – January 14, 2013 – Infocast, the industry-leading conference and event producer, is organizing the Nuclear Export Controls Summit on January 14 - 16, 2013 at the Renaissance Dupont Circle Hotel in Washington, D.C., where regulators and experienced nuclear export control compliance managers will gather to take part in the three-day, information-packed event. Even as a surge in international nuclear construction increases the importance of accessing export markets to US-based equipment providers, service suppliers and consultants in the nuclear supply chain, increased scrutiny is being placed on nuclear exports. In particular, the provisions of 10 CFR Part 810, which governs the US Department of Energy’s portion of the nuclear export control regime, are undergoing a major revision for the first time in some 25 years. These far-reaching revisions are expected to make explicit for the first time controls of “deemed exports” potentially caused by the exposure of controlled technologies, techniques or knowledge to foreign national employees, contractors and visitors, and tighten controls on dual-use technologies, fuel enrichment and processing technologies. 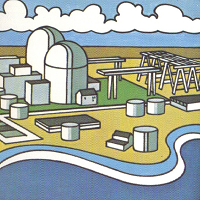 Combined with the traditional difficulties in determining whether a particular technology or service is subject to Department of Energy, Department of Commerce/BIS or NRC jurisdiction, only those equipment manufacturers, service suppliers, fuel suppliers, and nuclear operating utilities with the most up-to-date information will be able to stay compliant—and competitive—in an increasing international nuclear industry. Representatives from the Bureau of Industry and Security, Nuclear Regulatory Commission and the National Nuclear Security Administration will be present, along with industry experts from Enrichment Technologies, Inc., Exelon Corporation, GE Hitachi and Louisiana Energy Services, LLC among many others. The Summit aims to bring together respected thought leaders to share their knowledge on how to implement an effective compliance control system without overly restraining legitimate trade. The event also will feature a primer on Monday, January 14, Nuclear Export Control Regulation and Compliance, which will focus on providing participants with a basic understanding of nuclear export control regulations and the know-how to implement a compliance program. For more information or to register, please visit the event website at www.infocastinc.com/nuke-export13 or contact Infocast at 818-888-4444. For over 25 years, Infocast has produced the highest quality events, tailored to the needs of the industries we serve. It conducts intensive research on the marketplace, pulling from an extensive network of experts to give you the information and connections to succeed. At 5:18 PM Tokyo time on December 7, a magnitude 7.3 (Richter) / 4 (Japanese intensity scale) earthquake occurred in roughly the same region as the Great Tohoku quake. All tsunami warnings were lifted a short time ago as this report is written (7:40 PM Tokyo time, 5:40 AM Eastern time US) and only a one meter tsunami was observed in some locations. At around 5:18 PM on Friday, December 7, an earthquake (seismic intensity of 4) occurred in Hamadori region in Fukushima Prefecture. The conditions of the nuclear power stations are as follows. There has been no problem found with the monitoring post data, Units 1-6 main plant parameters, reactor water injection system, accumulated water transfer, water treatment facility and other facilities. Currently, no injury has been reported due to the earthquake. The maximum acceleration observed in the power station was 26.2 Gal (horizontal direction) at the foundation ground in Unit 6 Reactor Building. The maximum acceleration observed in the power station was 26.0 Gal(vertical direction) at the foundation ground in Unit 1 Reactor Building. The fluctuation of the monitoring post readings is being maintained within the range of normal fluctuation before and after the earthquake and currently no radiation impact to the outside of the power station has been reported due to the earthquake. No injury has been reported due to the earthquake. We will continue investigating the conditions of the equipments/facilities in the power stations. Tohoku Electric Power is investigating all conditions at Onagawa Nuclear Station but as of now reports no damage. By Jose Luis Antunez Pte electrical Nucleo Atucha II Project DirectorThe original contract was signed for Atucha II in May 1980 and contemplated that the plant was to be in operation in 1987. Between 1994 and 2006 the project was paralyzed until the relaunch of the Argentine Nuclear Plan promoted by the national government, through the Ministry of Federal Planning and Public Investment Services, which recognized the strategic value of this type of energy production for the country's growth.The construction of the plant, which initially had been in charge of Siemens, was solved with the resources end of science and technology in Argentina. The withdrawal of the German nuclear industry, the technical complexity of reviving this major project, and regulatory developments at national and international levels to optimize the reliability and efficiency of the plant, created a new scenario.Thanks to the high technical capabilities developed by national professional and is known to respond successfully to the challenges of this context.In this sense, being made in accordance with the provisions of all the work necessary for the commissioning of the plant.Among recent milestones, you can highlight the burden of demineralized (light) water for pressure testing of the systems of the primary coolant system of the reactor and moderator that began in October. This work is to pressurize the pipes and through the main circulating pumps 500,000 liters of water to test for leaks. This is the most important line of pipes of the plant and which is responsible for transporting heat generated in the reactor to the turbine.Moreover, in December we intend to load fuel into the reactor. 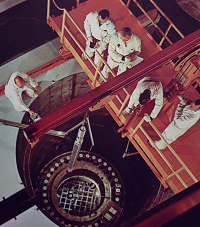 The task involves loading into the reactor's fuel elements 451 constituting the first core of the PBX. These fuel elements have been produced entirely within the country and contain 85 tons of uranium.Between February and April 2013 the plant will be tested at normal operating temperature and pressure. Finally, the light water will be removed, the system shall be dried, and loaded with 600 tons of heavy water produced at the plant Arroyito, Neuquén Province.These tests may commence in June 2013 to the first criticality of the plant, and then synchronize with the network. Thus, in the middle of next year, Atucha II is providing power to the national grid. Click here to see the official Nucleoelectrica Argentina S.A. photo gallery for Atucha II.